Being raised around the world of football has definitely produced good rewards for the current San Francisco 49ers head coach Kyle Shanahan, who took after his father to build himself a career as a football coach. Many say he is as good as he is because he began early, but those who know him well can testify that he has paid his dues as regards the time he has put in and the hard work he is known for. Let’s take a look at his bio, family, income and coaching career. The American football coach was born Kyle Michael Shanahan on December 14, 1979 and he had his high school education at the Cherry Creek High school in Greenwood Village after which, Carl Franks of Duke University gave him a scholarship offer which he accepted, but later transferred to the University of Texas at Austin where he started as a redshirt freshman. While in the University of Texas at Austin, he was a wide receiver for the Longhorn team until his graduation in 2003. 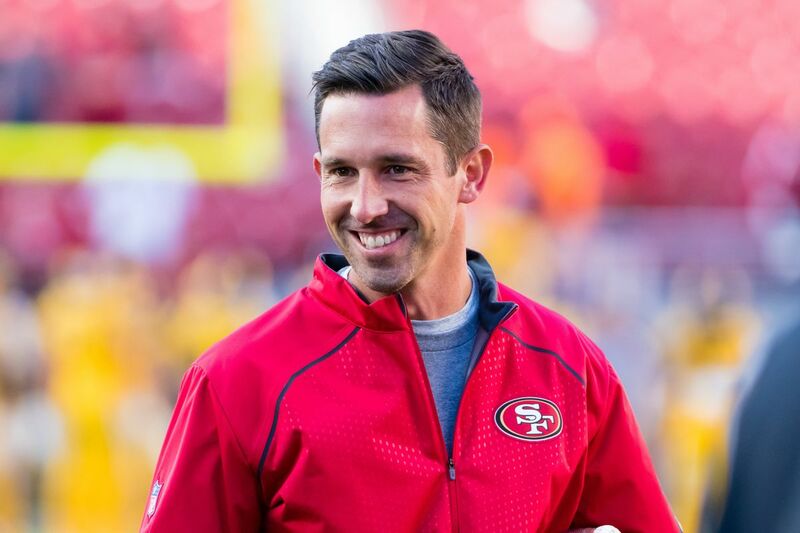 Kyle Shanahan was given his first shot as a coach upon graduation in 2003 when Head coach Karl Dorrell hired him as a graduate assistant at University of California, Los Angles (UCLA). The next year, his NFL career was launched when Jon Gruden hired him as the assistant coach for offensive quality control with the Tampa Bay Buccaneers. The team experienced success during Shanahan’s tenure but he left after two seasons at the Tampa Bay Buccaneers which ended in 2005. Shanahan took the position of Wide Receivers Coach in 2006 as he was appointed by Head coach Gary Kubiak, who had served his father Michael as Offensive Coordinator with the Denver Broncos. The next season in 2017, he was promoted to be the Quarterback Coach of the team and on January 11, 2008, he was made the Offensive Coordinator for the final two seasons in the team making him the youngest Coordinator in the NFL. 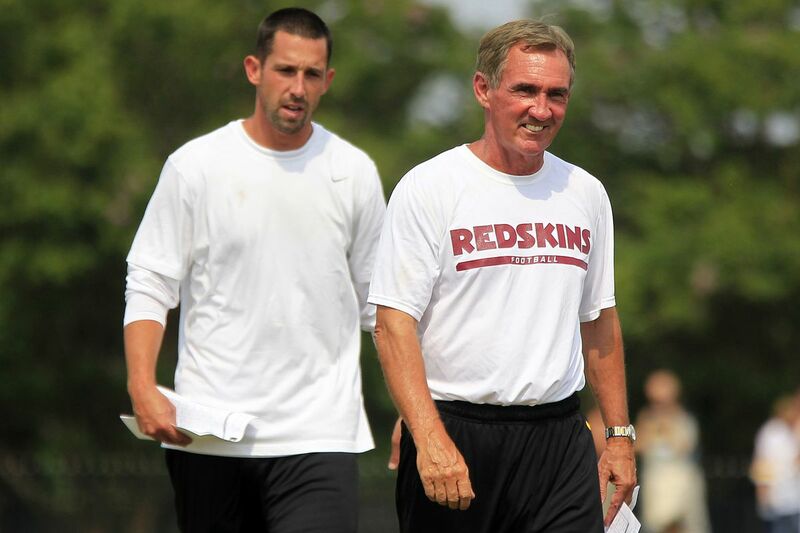 In 2010, Kyle Shanahan was hired by his father Michael as Offensive Coordinator with the Washington Redskins. His stay was not so successful coupled with the fact that people were making accusations that his move to Washington Redskins was an act of nepotism. In 2012, Shanahan was fined $2,500 for insulting the Replacement Officer and confronting another person after his team lost to the Cincinnati Bangles. He was fired alongside his father and the rest of the coaching staff on December 30, 2013. His next job was given to him by head coach Mike Pettine with the Cleveland Browns on February 1, 2014, as the Offensive Coordinator. However, his stay with the team was short-lived as he resigned on January 8, 2015, after disagreeing with the front office mandate. Luck was definitely on Kyle’s side as he got an offer that same year from the Atlanta Falcons. He had a successful season with the team and he had the highest scoring offense in the league in 2016. He also earned an 11-5 Record, a Super Bowl berth against New England Patriots and a division title in addition to being named the NFL Assistant Coach of the Year for 2016 season. The coach’s career with the Atlanta Falcons ended as he was criticized for being aggressive. His current job is with the San Francisco 49ers where he is the Head Coach with a standing contract that spans 6 years starting February 6, 2017. The San Francisco 49er head coach is definitely earning very well as most NFL coaches get paid very well for their work. However, his current salary details and net worth have not been made public so far. Kyle Shanahan was to born to Peggy and Michael Shanahan a former NFL head coach with the Los Angles Raiders, Denver Broncos and Washington Redskins. Kyle’s father won three Super Bowls; one with San Francisco as the Offensive Coordinator, and back to back with the Denver Broncos as the Head Coach. Kyle Shanahan has one sibling named Krystal who is his younger sister. Krystal attended the University of Texas at Austin, where Jenna Bush Hager, daughter of former president of the United States of America President George W. Bush, was her roommate. If you have ever wondered whether this gorgeous coach is married, the answer is yes. Kyle Shanahan is happily married to Amanda O’Donnell fondly called “Mandy”, whom he had dated for several years. Mandy studied English literature at the University of Colorado in Boulder and she is a proud mother of Kyle’s 3 lovely children; two daughters, Stella and Lexi and a son, Carter.